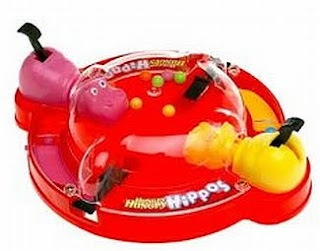 The Hungry Hippos Travel game is on sale at Target this week for $4.99. Use this $4/1 coupon (travel sized games are not excluded) and get it for $.99. It’s never too late to start Christmas shopping! I went for this deal and it wasn't on sale? None of their games were priced under $9.99. Could these be regional or by store? I wasn't even listed in the ad. go to Organic Grocery Dealer Coupon Generator and scroll down the list of target coupons. Also Hotcouponworld has them too, It mentions some specific games, but I have had to problem using them for any Hasbro game. I've been stocking up for the school toy drive. They make great traveling games. where did you get the hasbro coupon? If you use the $5 hasbro Target coupon you can get it for free. (I have been stocking up on all the $4.99 hasbro games like connect 4, hungry hippos, battleship and twister for christmas toy drive). I only buy three at a time so not issues.